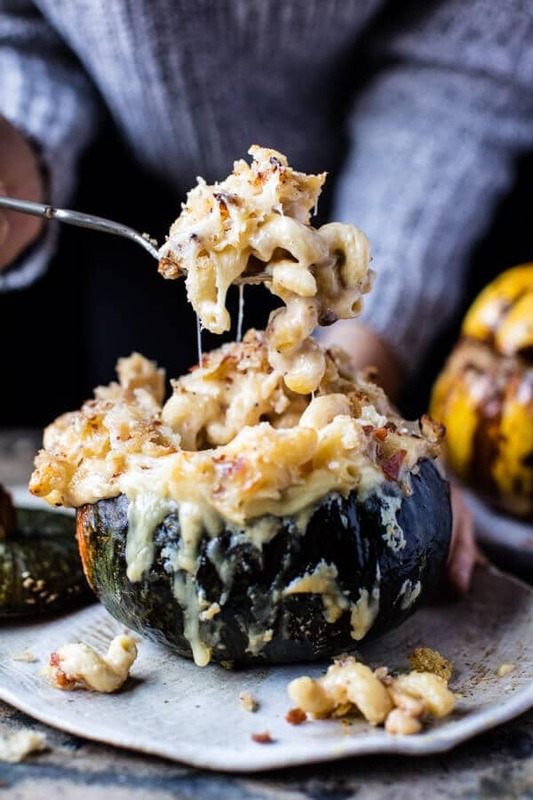 Baked Squash Mac and Cheese. I mean, because Monday just NEEDS cheese and carbs. Especially Mondays in November. It’s cold and the days are short (so short! ), and well, this is comfort food season! AKA – my very favorite season! Okok, but in all seriousness here. 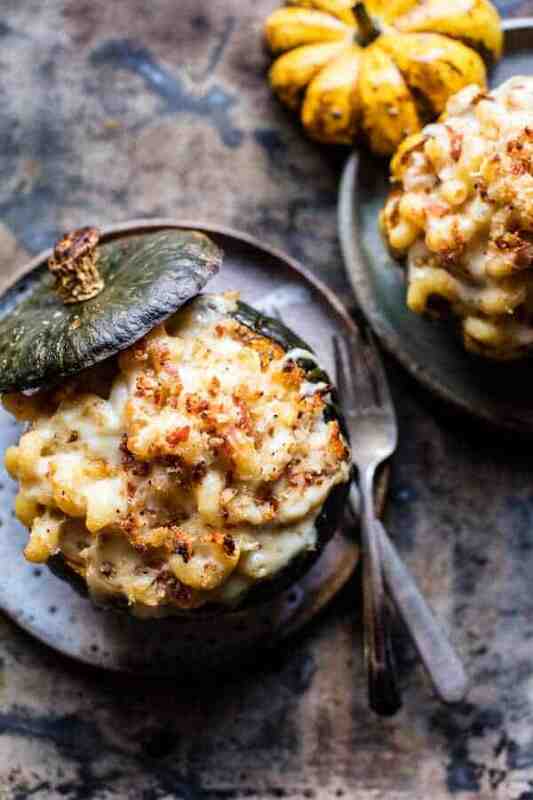 How cute are these baked squash mac and cheese? I’m dying over them, as in they are my favorite…and not just because they’re cute, but because they are delicious. I mean, that’s kind of obvious though right? 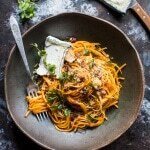 Do you see the cheese just clinging to that pasta, and bubbling out over those squash bowls?! Oh my gosh, SO GOOD. 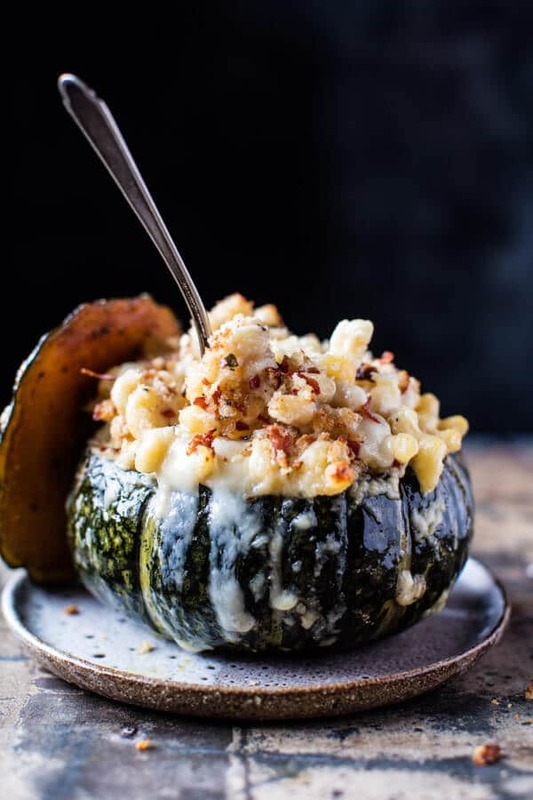 Think sweet roasted squash stuffed with the cheesiest of mac and cheese and then topped with sourdough and crispy prosciutto breadcrumbs. And how cute would these be on the Thanksgiving table, or served at a holiday party? They’re the perfect dish to WOW your guests, trust me. I mean, again, do you see all the cheese and pasta happening here? So seeing as it is Monday, I feel like I need to give you guys a little story to go along with all this cheese and pasta. The reason this mac and cheese came to be was really kind of stupid. I had over three gallons of goat milk in the fridge and was trying to think of savory recipes that would require a lot of milk. The amount of goat milk in my fridge right now is beyond insane. We milk the three milking goats once a day, and it gives us just over a gallon…we really love goat milk, but it’s kind of a lot to drink and cook with, especially without any of the brothers here right now. Saturday was my first time milking all three goats. My dad was off duty down in Denver (but not really off duty since he was totally hunting for props for me…ooops) and I was on goat watch. This meant that I had to milk all three goats for the first time. I’ve only ever had to milk just one, so I was kind of nervous to do all three. Guys, it’s no joke, milking three goats is a lot of work, and yes, my hands totally cramped on me, but it was also easier than I thought it was going to be. Probably because I was really dreading it, but whatever, I got it done! Then I played with the kids for a bit and continued on my way…down to Target to grab some Christmas goodies for an upcoming shoot…excited! Anyway, my point was that we have tons of goat milk, and of course mac and cheese was just the way to use it up. So I gathered up all the cheese in the fridge (literally) and made one of the yummiest mac and cheese I may have ever made. I’ve been wanting to stuff squash or mini pumpkins all autumn long, so clearly this seemed like the perfect opportunity. 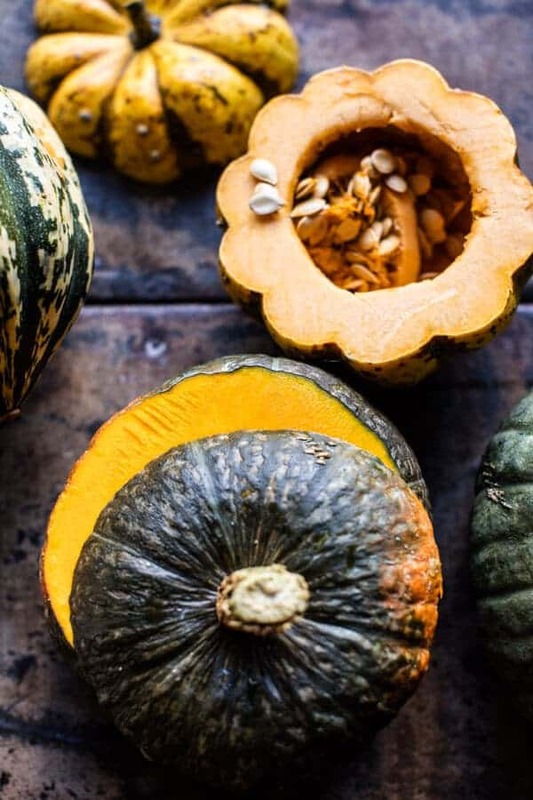 You can use acorn squash, mini pumpkins or any of the fun and different squash in the stores right now. Kobocha is my current favorite! The mac and cheese is as simple as can be. I used a combo of cheddar, gruyere, and provolone and it’s just as heavenly as it sounds. Then I topped it off with some crispy prosciutto and bread crumbs, and literally said YUMMMMMMM as I was sliding everything into the oven. The great thing is that stuffing the pasta inside the squash keeps it from drying out. It also keeps the pasta all hot and melty…perfect for every single bite, as it acts as its own little thermos. 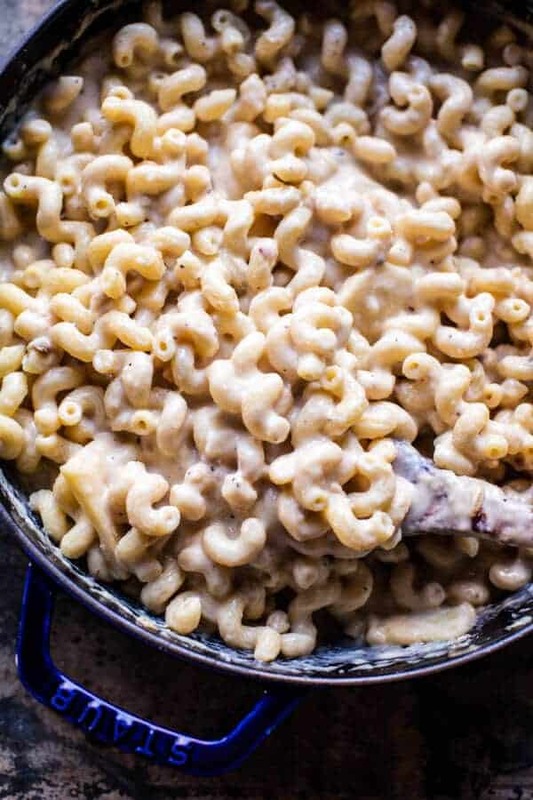 Plus, I kind of think that squash is a delicious pairing with this cheesy mac! They're the perfect dish to WOW your guests, trust me. Remove the tops of the squash and scoop out the seeds. Rub the insides of the pumpkins with olive oil, salt and pepper. Place on a baking sheet. Lay the prosciutto flat on the baking sheet next to the squashes. Transfer to the oven and bake for 10 minutes or until the prosciutto is crisp. Remove the prosciutto from the pan and continue baking the squash another 10-20 minutes or just until tender to touch but not falling in. Add the crisp prosciutto and bread to a food processor and pulse until fine crumbs form. Melt 2 tablespoon butter in a large pot over medium heat. Add the crumbs and cook until lightly toasted, about 5 minutes. Stir in the sage and cook another 30 seconds. Spoon the crumbs out onto a plate. Set aside. Bring a large pot of salted water to a boil over high heat. Boil the pasta until al dente according to package directions. Drain. Melt the remaining 4 tablespoons butter in the same pot used for the crumbs. Add the onions and cook until caramelized, about 10 minutes. Whisk in the flour. Reduce the heat to medium-low and let cook/bubble for 1 minute, stirring once or twice to avoid burning. Gradually whisk in the milk, whisking until combined. Raise the heat up to medium-high. Bring the mixture to a boil, whisking frequently until the sauce has thickened, about 2-3 minutes. Remove from the heat and stir in all of the cheese, mustard, cayenne, salt, and pepper. Stir until the cheese is fully melted (if needed, return the pot to the heat to fully melt the cheese). Stir in the pasta. 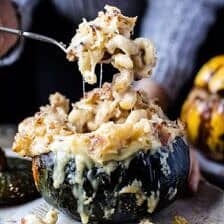 Spoon the mac and cheese into the roasted squash bowls, you may have leftover mac and cheese depending on the size of your squash. Sprinkle on the bread crumbs over and transfer to the oven. Bake for 15-20 minutes or until the crumbs are golden brown and the sauce is bubbling. Remove from the oven...dig in!! I’ll take the whole squash please! 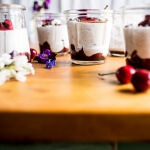 Cherry and Goat’s Milk Coconut Mousse. 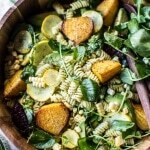 Basil Goat Cheese Pasta Salad. 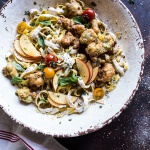 Goat Milk Fettuccine with Spicy Corn Fritters + Sweet Nectarine. Perfect! I hope you love this recipe, thanks Alexandra! Yes, my monday def needs this!!! Haha perfect! I hope you love this Ruth, thanks! YUMMMMM! Talk about ultimate comfort dinner winners!!! This sounds incred and looks even better! Yay! So happy you are loving this recipe Tori! Thank you!! This last looks truly delicious! From the quality cheeses you used, I know why! And that topping…? Haha so happy you are loving this one, Cassandra! Thanks so much! Sounds and looks heavenly, but I have a question. 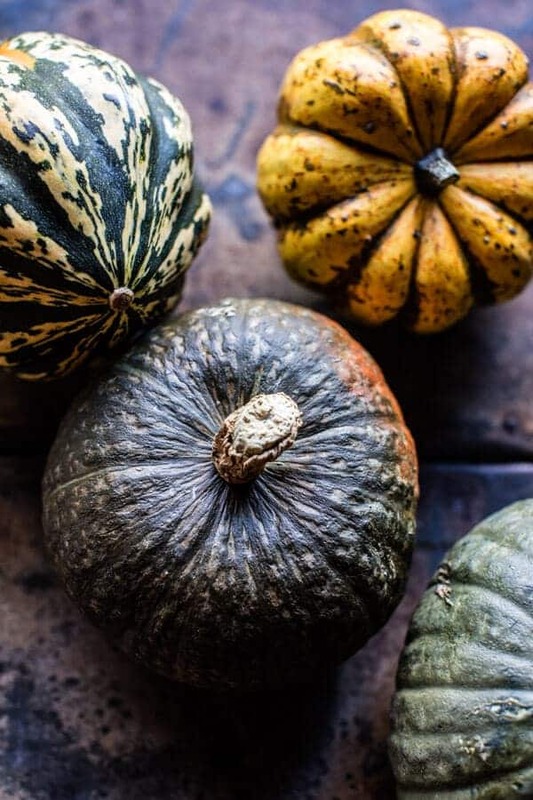 When you first bake the squash, do you have it sitting up or facing down? I’ve seen it done both ways but for the mac and cheese, I assume you have it sitting with the cut side up? And congratulations for getting all three goats milked. Did your dad find any cool props? Wow these are adorable and the filling looks so delicious! Kabocha is my favourite too! Perfect! Thanks so much Rhian! girrrl this looks INSANE, I am dying over those squash bowls! YES! So happy you are loving these!! Thank you! oh my god. OH MY GOD. OH MY GOD. Yes. This looks amazing. wow. I’m literally dying here. Haha so glad you are loving these!! Thank you so much! Can you please tell how much pasta to use? So sorry, it is 1 pound and the recipe has been fixed. Let me know if you have questions. Thank you! Truly love this. It look so freaking delicious 🙂 Thanks for sharing this. YES Monday definitely needs carbs! I wish I could find fresh goat milk here in Virginia! Not sure which stores would sell it! I want to get the full experience of this cheesy goodness! Haha well I hope you get it and you love the full experience of this! Thanks so much Amanda! Omg! I’m so in love with this! All that cheese and that its served in a squash! I can’t wait to try this! YAY! I hope you love it Andrea, thank you! Thank you Maria, really happy you are enjoying these! Wanted to pin this on Pinterest, but couldn’t. When I tried this morning it said select image, but there were no images to select and I couldn’t pin it. Just tired again and now there is no Pinterest option showing. Wondering if there’s a problem on your end or mine? Sorry for the trouble! The pin it button is on the photo when you hover over it. There is also a pin it button that scrolls with the page. PLease let me know if you have any other issues. Again, so sorry! Hi! I guess…that it is Kabocha not kobocha 🙂 I really like your stories and recipes! I’m wondering how this could be made ahead of time? Make the Mac a day before and just do the squash day of? I’m thinking of this as an app on thanksgiving! Hey Allie! You can make the mac at least a day in advance and stuff it into the squash as well. Then just bake and serve! Let me know if you have questions. Hope this is a hit! ? If I made this a day ahead (stuffed), do you know how long will it take to heat it up? Thanks so much!! Hey Dani!! I would say maybe 15-20 minutes longer. You might want to cover them with foil so that they can be heated all the way through. Let me know if you have questions. Hope you love this! Oh my goodness. I think I could eat this every day for the rest of my life! The presentation is stellar, but it looks even more delicious! You’re an all star for this! Thank you so much Karly!! So so happy you like it!! I’m at home with the flu and this literally made my day (possibly week & month). These pictures are so amazing! I’m just sad that I don’t have this ultimate comfort food right now. Awh I hope you get better soon! But I am happy I could make your day with this recipe haha! Thanks so much Stasja! 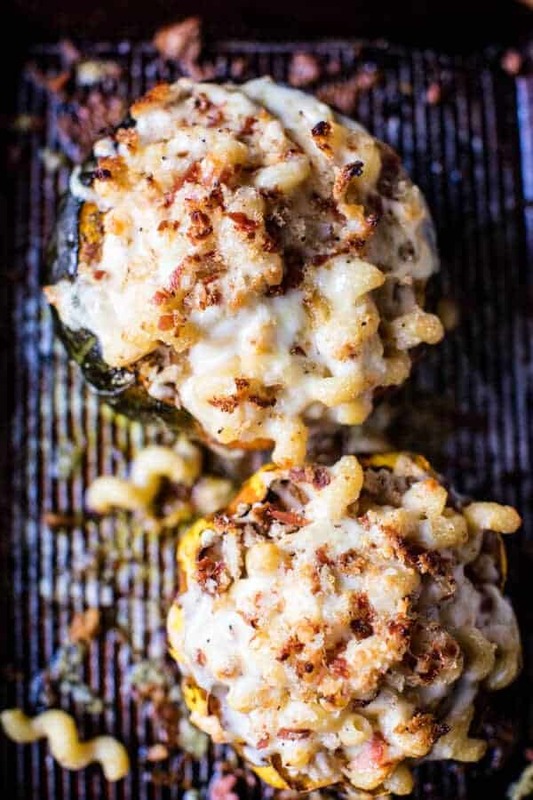 Stuffed squash has never looked better.. it must be that killer mac and cheese filling! Haha it has to be! lol! Thanks Laura! Oh mah gaaahd!! I’m home sick today- laying in bed reading this wondering if I can make this for breakfast! I have acorn squash, pasta & several cheeses. I didn’t read anywhere that this is a non- breakfast meal only 😉 here goes! Oh no you so can make this for breakfast!! Hope you love it! 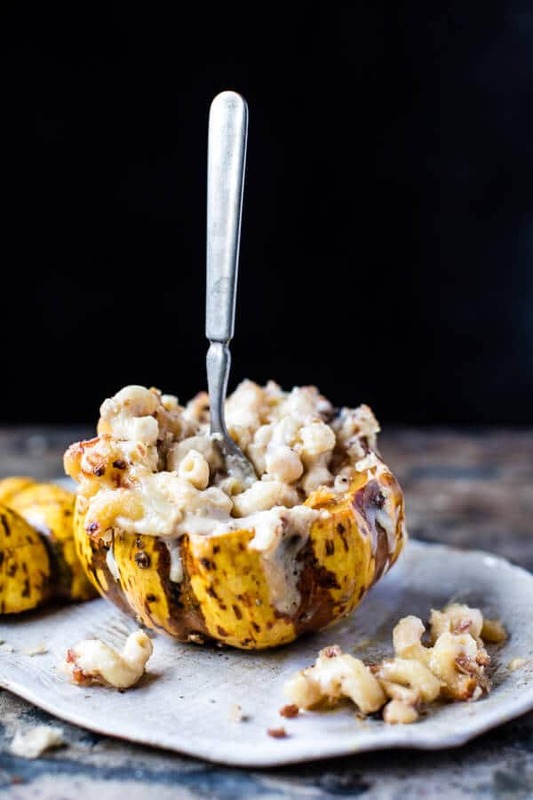 How could I NOT think of using a winter squash as a bowl??? :O It would be absolutely perfect! I’ll have to go out and buy tons of vegan cheese and cashew milk too, but it’s going to be SO worth it! Do you think I could use roasted butternut squash in place of the squash in the recipe? I have some that i need to use before it goes bad and this sounds delicious!! Do you think this would freeze ok? This looks so amazing I want to try it for thanksgiving, but know I won’t have time that day. Thank you! Thanks so much for this! I really want to try it out!